Finding your vision and your voice. 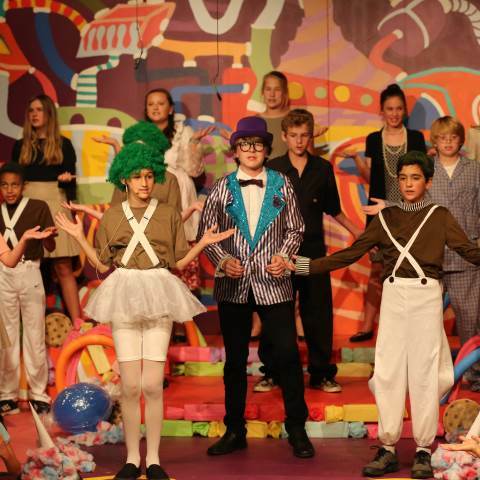 Darlington's middle grades arts program is all about creative exploration while offering a variety of opportunities to hone and refine your skills, talents, and unique creative voice. Explorations in different mediums such as painting, drawing, collage, fiber, paint, and pottery immerse children in the power of their own creativity. Students are taught within a sequential program that is adapted to support each individual’s developmental skills. Advanced Art opportunities are available for exceptionally dedicated and talented students. Expand your graphic communication skills in our middle grades photography class, where you'll learn about equipment, composition, lighting and photo editing. Middle school students participate in competitive and educational choral, instrumental and theater ensembles with performance opportunities throughout the year. Choose from Middle School Chorus, Concert Band, Jazz Band and String Orchestra. A formal theater course, taught by the Upper School theater director in the Zelle Black Box Theatre, connects middle and high school performers in a creative way. Each spring, students can also participate in the Thatcher Hall Musical. The Arts Academy allows you to get serious about your arts education while preparing for competitive auditions with personalized one-on-one instruction and challenging performance opportunities. Parker, Kate, and Ryland Scott ('23) have been at Darlington since kindergarten and even though they're triplets have very unique interests. Hear all about middle school from their perspective and learn more about the arts, athletics, and makerspace. Mar 26Blogs Fine Arts Takes New York City!